Welcome to the fourth lesson ‘Cassandra Installation and Configuration’ of the Apache Cassandra Certification Course. This lesson will cover the steps to install and configure Cassandra. State the various versions of Cassandra. Explain the steps to install and configure Cassandra on the Ubuntu system. List the steps to install Cassandra on CentOS. Let us know about Cassandra versions in the next section. Willing to have in-depth knowledge of Apache Cassandra? Click to get complete course details! Cassandra has multiple versions as mentioned below. You need to choose the right version for installation. Version 1.0, released on October 17, 2011, was the first production version. Version 1.2 was released on January 02, 2013 with virtual nodes added. Version 2.0 was released on September 04, 2013, which added lightweight transactions. Version 2.1 is the latest, which supports Cassandra Query Language or CQL 3.0. This was released on April 01, 2015. Cassandra is an open source product supported by DataStax enterprise. DataStax provides the package installations as well as drivers for Cassandra. Let us discuss the steps to install Cassandra on Ubuntu System in the next section. Each step will be discussed in detail in the following sections. Also, you can also choose to install Cassandra on Windows 7 or 8. Four 2 TB hard disks. Java JRE 1.7 or higher. Open JRE works. However, Oracle JRE is recommended. Python, for some Cassandra tools. Extra Packages for Enterprise Linux or EPEL, for some systems. DataStax provides packaged installation of Cassandra for many operating systems. You need to configure the repository for the Cassandra installation. You can provide instructions for the Ubuntu system and identify the commands for other systems from the DataStax site. Note the pipe character or vertical bar in this command. Note the pipe character of vertical bar in this command. Also, note that there is a hyphen character at the end. This command gets the repository key from DataStax and adds it to the aptitude keys of Ubuntu. After the repository is setup, update the packages and install Cassandra. This command leads to a series of messages while updating the repository. Enter Y when asked to confirm any updates. Note that the version being installed is 2.1.1, which is the stable version of Ubuntu. Once Cassandra is installed on the system, its services start automatically. After installing Cassandra, it is important to check the installation. Go to the configuration directory of Cassandra to check the configuration files. This command will change the directory. Note that Linux is case sensitive. Therefore, all the letters in this command must be in the lower case. Note that on some systems, the configuration directory will be /etc/cassandra/conf. This command will list the configuration files, such as cassandra-env.sh, cassandra-topology.properties, and cassandra.yaml. The first file is cassandra-env.sh - This is a Linux shell script for setting up environment properties, such as Java heap size and JVM parameters. The next file is cassandra.yaml - This is the main configuration file used to customize the Cassandra cluster. You can set parameters, such as cluster name, number of virtual nodes, data file location, seed providers, listen address, and Remote Procedure Call or RPC ports in this file. The last file is cassandra-topology.properties - This is the cluster topology specification file. It contains the list of nodes and their topologies, such as datacenter and rack configuration. For a single-node cluster, take the default configuration and modify only the cluster name. All addresses will be localhost, which is the same as 127.0.0.1. The cluster name is changed to Simplilearn Cluster. Other parameters, such as num_tokens and data file directories are set by default. These parameters need not be modified. The seed provider is set to 127.0.0.1, whereas listen_address is set to localhost, as both are same. The endpoint snitch is set to SimpleSnitch as the property file is not needed for this cluster. For a multi-node and multi-datacenter clusters, specify the node addresses and the cluster topology through the cassandra-topology.properties file. cassandra.yaml contains the default settings, as in case of a single-node cluster. Multiple seed nodes must be specified. The listen address also can be specified as a node address instead of localhost. The endpoint snitch should point to the property file by using the PropertyFileSnitch. The cassandra-topology.properties file contains the cluster topology for the entire cluster, while PropertyFileSnitch is used as the snitch. Further, you can also specify a default configuration to use for nodes that are not listed in the file. To do so, use the word default for the IP address as default=DC1:r1. For a production cluster, specify the node addresses, cluster topology through the cassandra-rackdc.properties file, and the snitch as GossipingPropertyFileSnitch. The gossip protocol is used to propagate the topology information. This configuration will be similar to the multi-datacenter configuration. However, the end point snitch will be specified as GossipingPropertyFileSnitch. The file cassandra-rackdc.properties contain the cluster topology information for the current node, while GossipingPropertyFileSnitch is used as the snitch. A sample file contains the datacenter and rack information only for that node. the rack for the node is specified using rack= line. This reduces the amount of information shared during the gossip protocol. This completes the process of installing and configuring Cassandra. After the configuration files are set up, start the Cassandra services. Typically, the installer starts the service immediately. In such a case, stop the service, remove the data, and then restart the service. Remember to enter the password as simplilearn when the sudo command prompts. This command will stop the running Cassandra service. This will start the Cassandra services. For a multi-node setup, this entire process has to be done on each node. Once the Cassandra service is running, you can connect to Cassandra using the Cassandra command line interface. Note that the commands are case sensitive. In the cqlsh prompt window, type help and then press the Enter key. This shows a list of commands provided by Cassandra. Next, you can type exit and press the Enter key to leave the Cassandra command line interface. This completes the process of Cassandra installation and configuration. 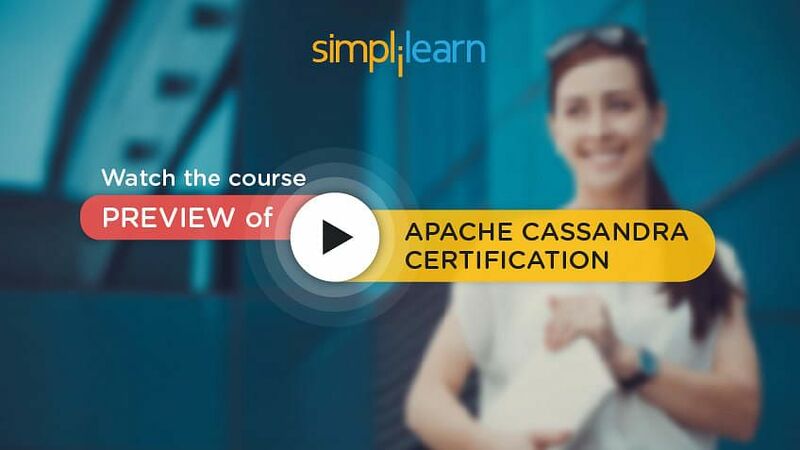 Looking for more information on Apache Cassandra? Why not consider enrolling in our Course! In addition to Ubuntu, CentOS is another popular Linux distribution. To install Cassandra on CentOS, it is recommended to use yum instead of apt. Finally, check the configuration directory. The configuration directory on CentOS is /etc/cassandra/conf. Cassandra has multiple versions, and the latest versions are 2.0 and above. It is important to choose the right operating system and machine configurations before installing Cassandra. Cassandra can be installed using the DataStax repository. Cassandra configuration files are stored in /etc/cassandra or /etc/cassandra/conf. cassandra.yaml is the main configuration file for Cassandra. Use the SimpleSnitch, PropertyFileSnitch or GossipingPropertyFileSnitch based on the type of cluster. Cassandra services can be started as a Linux service. cqlsh is the command line interface used to connect to Cassandra. This concludes the lesson on Installation and Configuration of Cassandra. The next lesson will focus on Cassandra Data Model.